If you plan to do a self-supported cycle tour, it will be crucial having a good map. 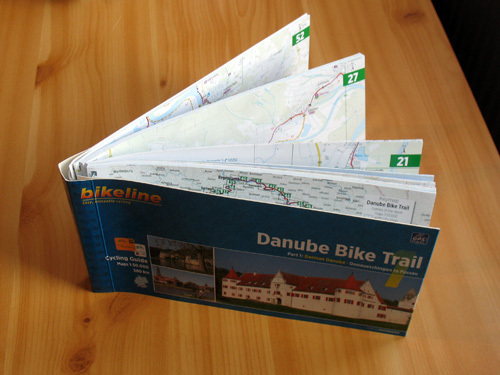 While there are many books out there, the two most recognised possibly are the "Danube Bike Trail 1 " guide book (by Esterbauer) and the "The Danube Cycleway " guide book (by Cicerone). We recommend getting the "Danube Bike Trail 1". It provides useful maps at a scale of 1:50,000, route instructions and hints as well as lists of (probably) all accommodations and camp sites along the cycle path, including phone numbers and estimate prices. You will even find cultural information about the places along the way. By the way: In case you book a self-guided cycle tour along the Danube, your tour operator will most probably provide a copy of this guide book. While those come in a language that is easier to understand, have in mind that the maps might be not as precise as in the Bikeline maps. We recommend to check before ordering.